This past April marked the 150th anniversary of the start of the Civil War. 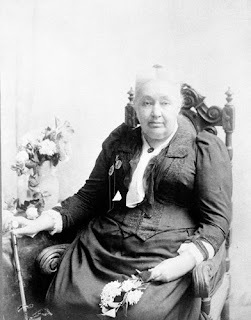 To mark the occasion, I will be writing a series of posts over the next several months about the lives of some fascinating women who made their mark during the Civil War. Varina Howell Davis was born at her family plantation, the Briers, near Natchez, Mississippi in 1826. Although her mother, Margaret Kempe was a Southern belle and the daughter of a wealthy planter, her father, William Howell was a Yankee from New Jersey. Although he came from a distinguished family (his father served several terms as Governor of New Jersey), it wasn’t enough to overcome the stigma of being a Northerner. He also wasn’t a very good provider, over the years, he worked as a planter, merchant, cotton broker and banker but none of them panned out in the long run. Her parents had to rely on handouts from Margaret’s family to help support their eight children. Varina’s only formal education was at Madame Greenland’s School, a prestigious academy for young ladies to Philadelphia. The academy’s principal, Miss Reynaud, praised Varina’s abilities, calling her ‘capable and very smart.” High praise indeed but Southern belles were expected to be demure, deferring to their men, god forbid they should be seen as bluestockings. 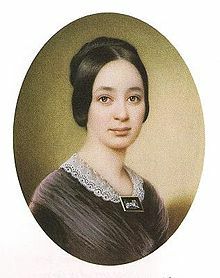 Varina, however, was highly intelligent and opinionated, her views shaped by the lessons in history and politics she absorbed from a family friend, Judge Winchester. She had to work hard to hide her light under a veneer of Southern charm. The newlyweds moved into a two-room cottage on the Brierfield plantation that had been given to Jefferson by his brother. However there was soon tension between the couple, when it was decided that Jefferson’s widowed sister Amanda and her seven children would be moving in with them when their new house was built. This was a decision that was made without Varina’s knowledge. This was just the first hint in their marriage that Jefferson’s family was going to be a problem between the couple. Jefferson’s oldest brother Joseph was particularly controlling. But it wasn’t just Jefferson’s family, Varina’s family also were financially dependent on the couple which caused resentment. The marriage was also strained by frequent separations. First when Jefferson was campaigning for Congress, and then when he served as an officer in the Mexican-American war. This was a difficult time for Varina; she was forced to return to Brierfield where his brother made her life miserable. When Jefferson returned to Washington, this time as a Senator, Varina couldn’t wait to go with him. Varina had a passion for politics, and Washington, D.C. was like Nirvana. As her husband rose in political ranks, she rose in the ranks of Washington society, becoming one of the city’s most popular and also one of its youngest hostesses. Men found her handsome, intelligent and a good listener, while the women were taken by her spontaneity and good humor. For once her intelligence was not a hindrance. 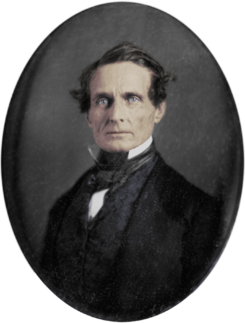 When Jefferson Davis was appointed Secretary of War under Franklin Pierce, the couple served as official hosts at the White House in place of the First Couple who were still grieving the death of their young son in a train accident. Her happiness was complete, when after seven long years; the couple had their first child in 1852. Three more children followed in rapid succession. Not everyone was enamored of Varina. She was a strong woman, one with definite convictions, and a caustic wit. Some thought her too forward, especially since she didn’t retire from social life when she was pregnant, which was against the established fashion. When it looked like the Confederacy was about to lose the war, Davis ordered Varina to go to North Carolina to wait for him. She raised money for the trip by selling everything they owned, netting $8,000 in gold. Children in hand, she fled to North Carolina and then Georgia where the family was reunited. But it was the end of the line; they were discovered by Union soldiers. Varina convinced her husband to try and escape by donning a disguise. She threw her cloak over him and a woman’s shawl over his head. Unfortunately, the cloak didn’t hide Jefferson’s spurred boots. The former President of the Confederate States was now a Union prisoner. Varina took her children to her parents in Canada, and then spent two years lobbying for his release. Jefferson’s enemies had a field day with the report that he had tried to flee dressed like a woman, humiliating him, and infuriating Varina. When he finally was released, he was ill and depressed. The family lived abroad for several years in Europe and Canada as Davis tried unsuccessfully to establish himself in business. Varina, who was high strung at the best of times, had a nervous breakdown in 1876. While she recovered in Europe, Davis sought solace in the admiration of his other women, including Virginia Clay the widow of Jefferson’s fellow inmate, which infuriated Varina. The couple suffered further losses when their remaining two sons William and Jeff Davis Jr. died (two other sons Sam and Joe died years earlier). They retired to Biloxi, Mississippi where an old friend Sarah Dorsey bequeathed Beauvoir to them in her will. There Jefferson worked on his memoirs. After Jefferson died, Varina stayed at Beauvoir for a few years. She then donated it to be used as a Confederate veteran’s home and moved to New York, where she supported herself as a writer until her death in 1905. In 1889, Davis finally passed away at the age of 81. More than 60,000 people paid their respects as he lay in state. After his death, Varina Davis published Jefferson Davis, A Memoir (which was a financial failure) in 1890. She shocked Southerners when she up and moved to New York City the following year to pursue a literary career, taking a job as a journalist with Joseph Pulitzer’s New York World for $1,500 a year. To make matters worse, she became friends with Julia Dent Grant, the widow of Ulysses S. Grant, who was among the most hated men in the south. She scandalized and offended many when she attended a reception where she met Booker T. Washington, socializing with him as if he were an equal. She died in 1906 after a bout with pneumonia, surrounded by her daughter Maggie and her grandchildren. Great post--looking forward to more! Do you know of a good biography of Varina Davis? Hi Susan! Yes, Joan Cashin wrote a biography of Varina called First Lady of the Confederacy, Varina Davis's Civil War. Also Civil War Wives by Carol Berkin. She actually is my great great great great Aunt. Why is there not more discussion out there about the fact that this woman was OBVIOUSLY part black? 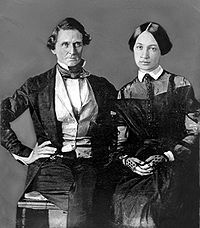 I came across the famous photo of her sitting next to Jefferson Davis while reading Wikipedia's article on Davis, and I IMMEDIATELY saw it. I'm flabbergasted at the fact that this is not obvious to others and widely discussed in history. All of the other actual photographs of this woman continue the same theme, it wasn't just an odd photograph for her. The paintings of her, such as the one featured here, seem to have tried to make her look more "European" than what the actual photographs of her reveal. And you can see from the photographs that as she got older, she seemed to look even MORE black. Her father, Mr. Howell, must have slept with one of his slaves. There is no doubt in my mind. No kidding! You buried the lead here! The real scandal is that a black woman was at the heart of the Confederacy during the Civil War. I was surprised that most historical accounts of her life do not seem to even ask the question of her mixed ancestry. She is so obviously not 100% white though. What an interesting subject for women's history! I'm sure that a historian who knew more about the Confederacy to figure out how Varina felt about her ancestry and how she felt about her relatives on her dad's plantation (both white and black). Varina Howell Davis was at least part black. She also said, later in life, that the right side won the war. Davis told her to get herself killed -- did you know that? It's in her book, go read it. He also ran away in a dress. Ironic that old slaver Jeff had a quadroon wife.